Normally, when a book screams at me, I'm going to be a movie, someday! I let it go. 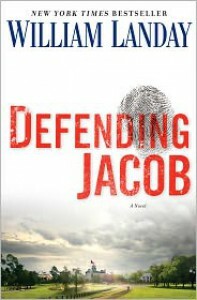 In the case of Defending Jacob, I sullenly read on, primarily because it was this month's selection for my book club at the Adult Center. I would no sooner have shown up on Tuesday AM to face this band of retired teachers and librarians without having read the book, than I would have smoked pot before taking the SAT's. So on I read, becoming increasingly annoyed as implausible plot twists piled one on top of the other. The first personal narrator is a seasoned district attorney who finds himself on the other side when his son is accused of murdering a classmate. There are descriptions of affluent suburban life and the hell of middle school which lend it a breezy relevance, but according to my lawyer friends the legal proceedings strain credulity. I see things through the prism of literature, not the law, so I enjoyed all the philosophical musings about a murder gene which puts this squarely into the realm of Nathaniel Hawthorne and his fixation on the sins of our fathers. There are also some insights into the risks and rigors of parenting that hit me in the heart, but overall I found this to be predictable and a bit too long. It was like a two-hour season finale of a TV crime show, with a lot of extraneous padding to allow for more commercials.